This is a really tasty juice and a great way to get loads of minerals and nutrients into your system quickly. And talk about simple, it doesn’t get any easier than this. Juice 1/3 pineapple, a few mint leaves, and one or more bunches of your favorite greens. Spinach, bok choy, collards, kale, lettuce, parsley, etc. Depending on how much juice is in your greens you may need to adjust the amount of greens or pineapple. Wow this was one of the tastiest and the healthiest juice recipe I ever had in my life. 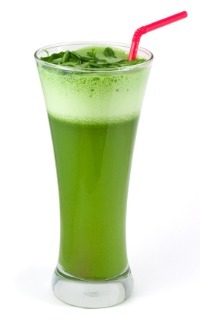 Adding the mint leaves was one of the key point that make this juice a healthy one. All those leafy ingredients will surely make you healthy than ever you are if you have this juice weekly. Hugh's reply**** Just leave them out of any recipes if you're sure it was nothing else in the juice. I love this. I used 1/4 pineapple 1 sprig mint and a salad spinner full of baby greens. It tastes too good to be healthy but I know it is :) I'm hooked. I just tried this one, using pineapple, spinach and mint - was so surprised and delighted at the flavour, just divine. Thanks for sharing it with us. Great drink, juice the core. It's where all the Bromolene is. I am new to juicing. When you juice pineapple, do you take off the outer peeling and core? I have an Omega Masticating juicer. You should be able to juice the whole thing, skin and core without issue. I have a recipe posted, also got one good review. I tried this one and was very surprized at how good it tasted. Most of these are items I keep at my house anyway as I eat a lot of greens. I dont do any juicing my montell health master is just great for this. I loved this juice! As a person with geographic tongue I knew the pineapple was going to burn. So I sweetened it with 2 small red apples and it came out tasting wonderful and very refreshing! This one didn't do so well in my Omega Vert. It was half foam and not a very big yeld at that. I ended up adding some other things to get a fuller glass.